Alstom and Dutch railway operator Nederlandse Spoorwegen have opened a new Coradia Stream production line in Katowice, Poland. The production line will focus on the Intercity Next Generation (ICNG) trains, which will be manufactured at Alstom’s Katowice site. It is one of the biggest facilities Alstom owns. The following people were present at the opening along with Alstom employees: Bert Groenewegen, CFO of Nederlandse Spooorwegen, Roel Okhuijsen, Director New Rolling Stock at NS, Gian-Luca Erbacci, Alstom Senior Vice President Europe, and Radosław Banach, Managing Director of Alstom’s Katowice facility. The Coradia Stream production line boasts cutting-edge technologies and processes that will improve performance and bring down manufacturing time. The new hall measures 6,500 square metres. To compare, Alstom’s entire Katowice site measures 250,000 square metres. The new hall contains 20 work stations that can deal with every step in the production process, from pre-fitting to interior fitting. Tasks such as car body shell welding and erection, painting and final testing will take place in different halls. Alstom says the production line will produce one train car per day. Alstom has employed 110 people to work on this new production line. In total, the company employs 500 people on the Intercity Next Generation project. Alstom has opened this Coradia Stream production line to supply 79 of the intercity versions of these trains to NS. It won the contract in July 2016. The trains will have a maximum speed of 200km/h. Furthermore, each train will have more than 300 seats. Consequently, the entire fleet will have 25,000 seats. Each trainset will consist of driving, intermediate and end cars. This will optimise capacity. Beneficially, the platform is flexible for different configurations, ranging from three to ten-car versions. 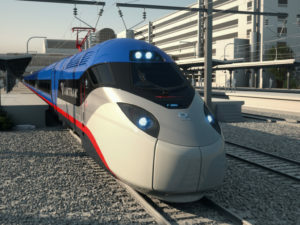 NS will receive eight and five-car versions. The trains will feature the Dutch automatic train control system ATB and ERTMS. Built to run on both 25kV AC lines and 1.5kV DC lines, the Coradia Stream trains can operate both on the Dutch high-speed network and the country’s main rail network. The trains’ interior will have spacious and brightly lit areas that will be able to accommodate wheelchairs and bicycles. Another key point is that they will have special restrooms for passengers with reduced mobility. And as passengers now expect, these trains will also have wifi and power sockets. The wide doors and real-time passenger information displays will further enhance passenger experience. Delivery will commence in January 2020. The trains will then operate on the high-speed line between Amsterdam and Breda in 2021. They will then also run on the Den Haag-Eindhoven corridor in 2022. Overall, this contract is worth 800 million euros to Alstom. It includes options for additional trains. All in all Alstom’s Katowice site produces for 19 projects in 10 countries.